At PortaFab, we specialize in designing structural mezzanines to satisfy the specific requirements of wide variety of applications. We ask questions to understand the intended use of the mezzanine to ensure the final decision will satisfy your need for efficiency and safety under your planned working conditions. The design of a mezzanine is not as simple as specifying a size and load capacity. As the use varies, so must the structural design. Mezzanines used to support offices are designed with tighter lateral stability standards than those designed for general storage. Applications with high point loads require that special attention be paid to the ability of the deck to distribute these loads to the support members. 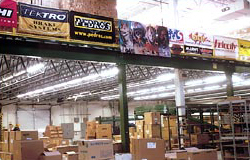 In order to effectively service a broad range of applications with cost effective solutions, we offer different connection systems, many flooring options, and a number of accessories in addition to our lines of load-bearing modular wall systems that can also be used in designing mezzanines. Columns can often be spaced to accommodate one's needs for more space under the mezzanine. 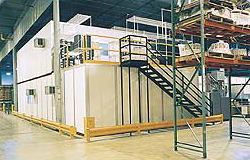 Using load-bearing modular wall systems is one of the most cost effective ways to add both office and storage space.